Researchers at Texas A&M have developed a wireless implant that lets them control the movement of the roach remotely. These little backpacks are plugged into electrodes that are directly inserted into the roach's nervous system. Researchers were able to make the roach turn left or right, which they compare to pulling on the reins of a horse. At the moment, it only works 60% of the time, and it appears some bugs get used to the directions and begin ignoring them. The research is targeted at taking advantage of the "rapid and agile" movement that animals naturally perform, by turning them into cyborgs or "hybrid robotic systems". There's a lovely ethical issue here: is it alright to augment a living creature with electronic components in order to control them? Insects are comfortably distant from us but what about mice, rabbits, or monkeys? Should we "operate" them, as we do machines? The team at Texas A&M don't seem bothered by that. 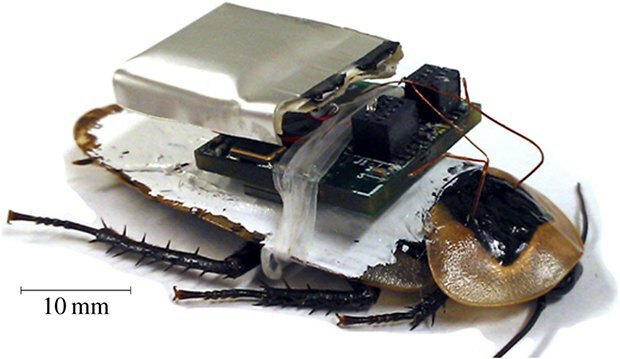 They're focusing on installing sensors so the operator doesn't have to see the roach and to make a remote-controlled cyborg roach more useful by measuring humidity, temperature, or gases in the air.